Our customer information is intended to help us conduct our business in a professional manner and will not be disclosed to others. We intend to give you as much control as possible over your personal information. 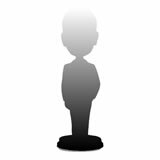 In general, you can visit www.bobbleheads2u.com on the Web without telling us who you are or revealing any information about yourself. There are times, however, when we may need information from you, such as your name and address. It is our intent to let you know before we collect personal information from you on the Internet. If you choose to give us personal information via the Internet that we may need -- to correspond with you, process an order or provide you with a subscription, for example -- it is our intent to let you know how we will use such information. If you tell us that you do not wish to have this information used as a basis for further contact with you, we will respect your wishes. 2.What Personal Information About Customers Does www.bobbleheads2u.com Gather? The information we learn from customers helps us personalize and continually improve your shopping experience at Apple2care.com. Here are the types of information we gather. Information You Give Us: We receive and store any information you enter on our Web site or give us in any other ways. Those include your personal details you enter when creating a customer account as well as product pages you are visiting and E-Mail subscriptions you are making. We use the information that you provide for such purposes as responding to your requests, customizing future shopping for you, improving our store, and communicating with you.